MARUAH (Working Group for an ASEAN Human Rights Mechanism, Singapore) and the Singapore Film Society are proud to present “The Way I See It: Stories on Human Rights”, a film screening on 10 December 2010 to commemorate Human Rights Day. 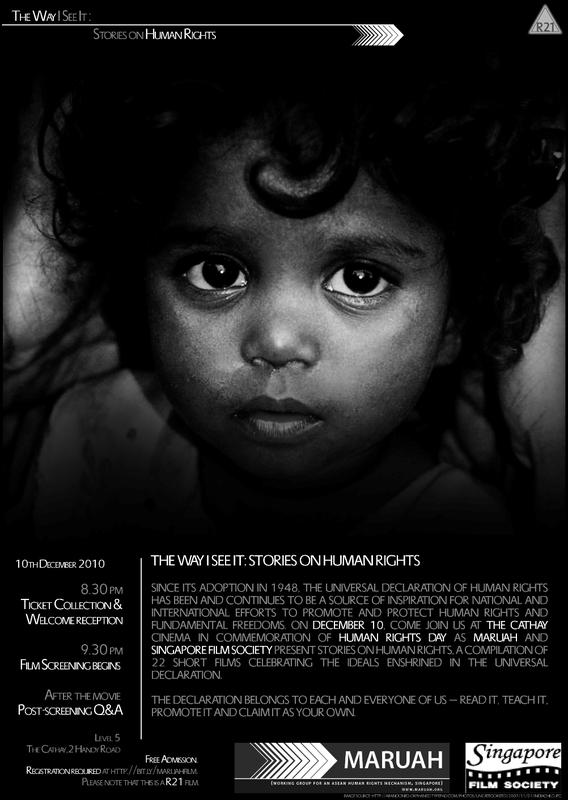 The highly-acclaimed Stories on Human Rights was a film project commissioned by the United Nations Office of the High Commissioner for Human Rights (OHCHR) in 2008 to commemorate the 60th anniversary of the Universal Declaration on Human Rights. Stories on Human Rights features the work of twenty-two directors inspired by the six themes of the Universal Declaration: culture, development, dignity and justice, environment, gender and participation. You can also view the trailer. Admission is free, but prior registration is required as seats are limited. The screenings will be at Level 5, The Cathay, 2 Handy Road. Because of limited seats, we cannot reserve more than 4 seats per person. You will receive an email in response, which will state clearly whether your request is confirmed, or you are on the waiting list. If it is confirmed,you need to pick up your tickets at the door on the day of the screening no later than 9:00 pm, otherwise the tickets will be released to those on the waiting list. Tickets will be issued on a “best available seat” basis. The film has been rated R21. Age verification will be conducted at the door; please bring some identification with you. This entry was posted on Monday, December 6th, 2010 at 12:20 am and is filed under Uncategorized. You can follow any responses to this entry through the RSS 2.0 feed. You can leave a response, or trackback from your own site.